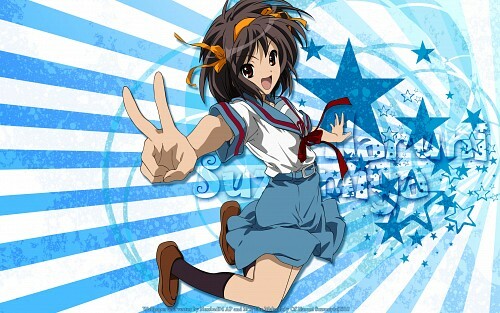 The Melancholy of Suzumiya Haruhi Wallpaper: Be positive!! Minitokyo »	The Melancholy of Suzumiya Haruhi Wallpapers » The Melancholy of Suzumiya Haruhi Wallpaper: Be positive!! added widescreen and txtless version! The result you see. Hope you like it! Is so cute!I love the background! What a great background! nice job! This is a great wallpaper. Haruhi is so pretty!